As apex predators, great white sharks are vital to the health of our oceans. They control the food chain from the top down, feeding on the weakest specimens first and keeping the marine ecosystem in balance. 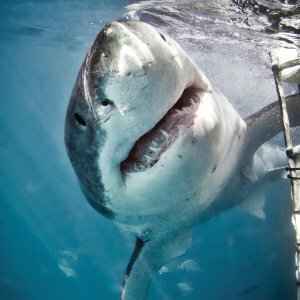 Numbers of great whites around the world are extremely low – an estimated 2000 to 3000 individuals or lower. The Western Cape coast has one the densest populations on the planet, but a recent study estimated that even here, only 353 to 522 are left. Up to 100 million sharks are killed every year by unnatural causes, including shark nets and drumlines, finning and poaching, depletion of food sources due to overfishing, and bycatch (Worm et al 2013). Only around 10 people worldwide are killed by sharks each year, compared to approximately 2900 people per year who die in hippopotamus attacks. White sharks all have their own personalities and are an intelligent and curious species. Over the last 40 years it is estimated that global shark populations have declined by 90%. White sharks can live to be more than 70 years of age. Using radiocarbon dating scientists have shown extreme longevity in white sharks, with one study finding age averages up to 73 years old! The largest great white shark ever recorded was in Guadalupe Island in Mexico in 2013. Nicknamed Deep Blue, her length was estimated to be over 7 metres (23 feet). The white shark’s only natural predator is the orca, or killer whale. Orcas are rarely seen off the South African coast – which is a good thing as Great Whites tend to steer clear while they are in the area. Eating shark meat may be toxic to human health. The finning industry is one of the major causes for the decline in the global shark population, but recent studies have found high levels of arsenic, mercury and other toxic compounds in shark meat – another good reason to stay away from shark fin soup!